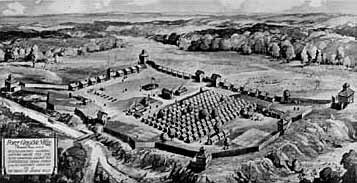 Following his victory at the Battle of Fallen Timbers in August 1794, Wayne used the fort to encourage natives along the Maumee River to negotiate. With such a sizable American force nearby and the failure of their British allies to assist them against the United States, many tribal leaders made their way to Fort Greene Ville seeking peace terms. The Treaty of Greenville of August 3, 1795, brought a brief peace to the Ohio Territory. As more and more white Americans moved into Ohio, some would violate the treaty's provisions and move onto land in northwestern Ohio reserved for American Indians. Warfare began again as a result.